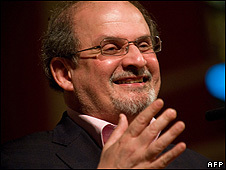 Author Sir Salman Rushdie has emerged as the frontrunner to win the Man Booker Prize for Fiction, adding to his three existing Booker awards. The 61-year-old, who first won with Midnight's Children in 1981, is in the running for this year's prize with The Enchantress of Florence. He faces competition from 13 other writers including Aravind Adiga, Joseph O'Neill, Linda Grant and Tom Rob Smith. The winner of the £50,000 prize will be named at London's Guildhall in October. The award, which is celebrating its 40th anniversary, is given to the best novel of the past year by an author from the UK, Ireland or the Commonwealth. Sir Salman's latest tells the story of a woman attempting to command her own destiny in a man's world. It explores the differences between East and West, using the settings of Renaissance Italy and the ancient Mughal Empire. Earlier this month, Sir Salman's Midnight's Children won the Best of the Booker prize, voted for by the public. The same novel also won the Booker of Bookers in 1993. Hot on Sir Salman's heels this year is the debut novel by Aravind Adiga, The White Tiger. Adiga, Time magazine's Asia correspondent, exposes the underbelly of India's new Tiger economy using a series of letters sent by her main character, Balram, to the Chinese prime minister. Joseph O'Neill's post-9/11 novel Netherland, is a story about dreams, love and friendship through the eyes of one man's love for the game of cricket. The Clothes On Their Backs - a story about survival and how garments inform who we are by Orange prize-winner Linda Grant - also makes it into the longlist. Alongside it is Tom Rob Smith's Child 44, a critically-acclaimed detective thriller set in Soviet Russia. Also in the running are Sea of Poppies by Amitav Ghosh and The Secret Scripture by the previously-shortlisted Irish writer Sebastian Barry. The longlist was chosen from 112 entries; 103 were submitted by publishers and nine were called in by the judges. According to the chair of the panel Michael Portillo: "The judges are pleased with the geographical balance of the longlist with writers from Pakistan, India, Australia, Ireland and the UK." "We also are happy with the interesting mix of books - five first novels and two novels by former winners, " the former MP added.